In my last post I described four experiments/series of experiments I wanted to do. One series (= Expt. C) I'd blogged about back in June; at that time I wrote that I was all set to do the experiments (strains frozen in log phase and ready to go). I hadn't blogged about any results, so I jumped to the conclusion that I hadn't yet done the experiments, but yesterday I discovered I had done them, with the results all neatly analyzed and graphed in my notebook. Here are the results. 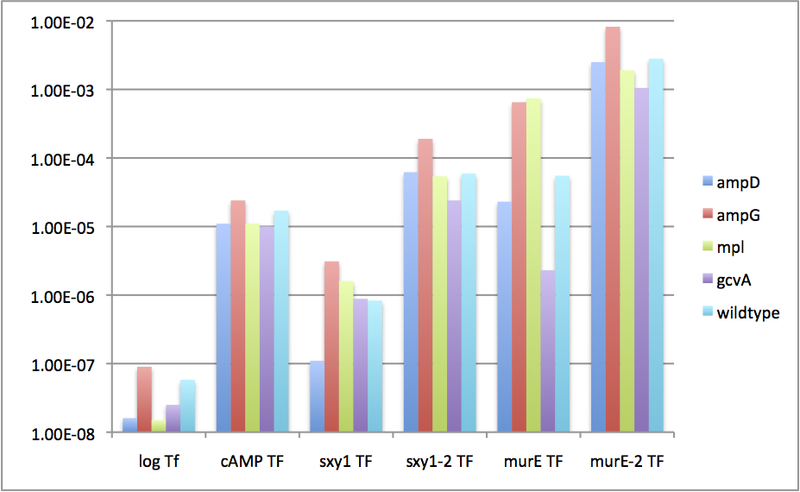 The top graph shows the culture densities and the bottom graph shows the transformation frequencies. The purpose of the experiments was to find out if any of the cell-wall-peptide recycling mutations the 4 different colours of bars, plus the turquoise wildtype control) alter transformation frequency under conditions that do or don't induce competence. I had to control for culture density because this has a strong influence on competence induction. The first two sets of bars are from the first experiment, testing cells in log phase (not inducing, left set of bars) or in log phase plus cyclic AMP (partially inducing, second set of bars). There's very little difference in culture density or transformation frequency between any of the mutants and the wildtype control. 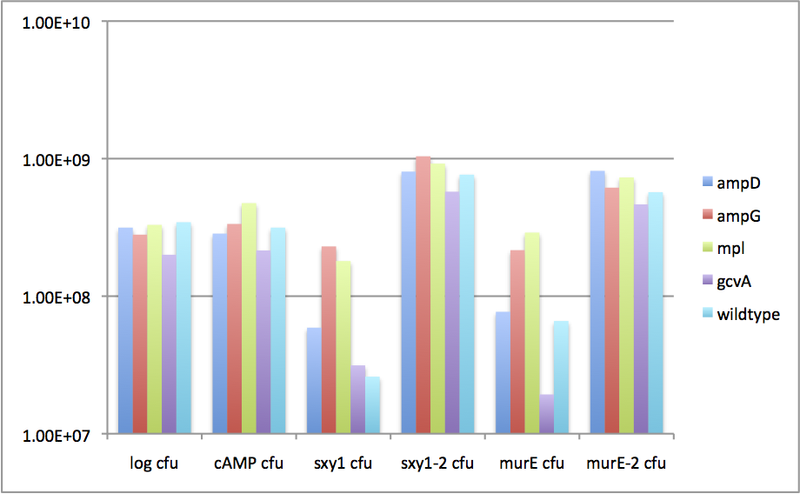 But the values for the log phase transformation frequencies (bottom graph, left set of bars) is not very reliable because the total numbers of antibiotic resistant colonies I counted were 1, 5, 1, 1, 4. To get better numbers I need to repeat this experiment using cells at a slightly higher density (OD = 0.2 rather than 0.1 (still log phase) and plating larger volumes of cells (using more plates). 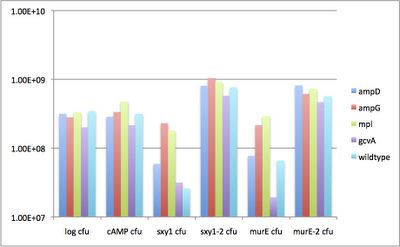 I did the second experiment twice because the culture densities were too low the first time. 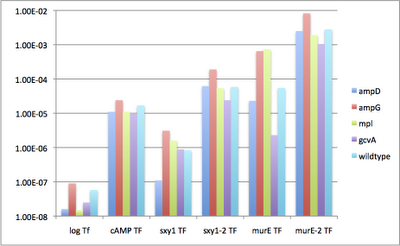 There appear to be some (small) consistent differences in transformation frequency between the different mutants. But some of the numbers are still unreliable (too low, or too many colonies to count), so I need to do this experiment again too. The problem with the low cell densities was partly because my plan of starting each experiment with cells that were already in log phase (grown and frozen in a previous experiment) didn't work very well. Apparently cells in log phase don't survive being frozen and thawed very well. I started each culture by thawing cells, diluting them into fresh medium, and checking the OD (measure of culture turbidity), but when I checked the OD an hour later it usually had gone down instead of increasing 3-4 fold. Apparently most of the cells contributing to the initial OD were not viable. So then I'd have to allow the culture an extra 2 or more hours for the surviving cells to reach the desired density, or close enough that I thought I could use them. And because these cells are the survivors of whatever trauma the freezing and thawing may have induced, they might not yet have settled down into a reproducible physiological state, which might have influenced their levels of competence. So this time (first experiment repeat tomorrow, second one repeat on Tuesday) I'm going to allow lots of time for the cells to recover from freezing and get comfortably into log phase before I transform them. Sunshine and benchwork = bliss?